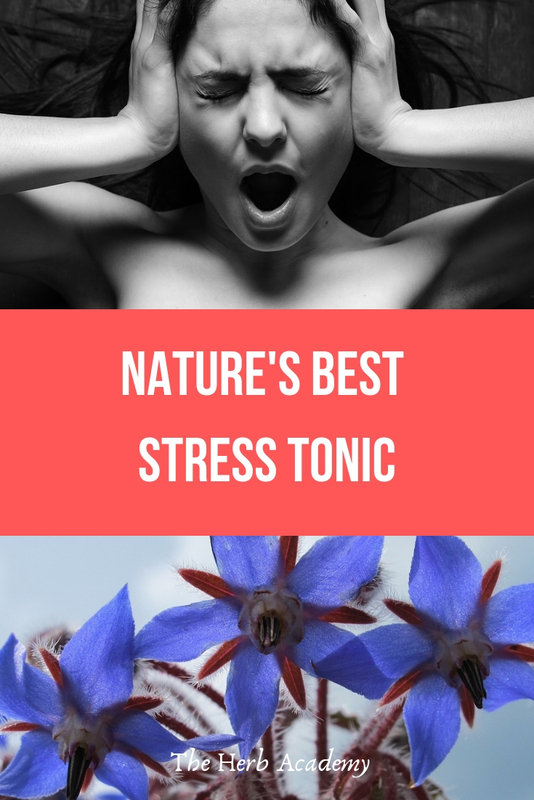 An infusion of Borage leaves is nature’s best tonic for stress and stress related problems. The leaves contains vitamin C and are rich in calcium, potassium and mineral salts. European herbalists use borage as an adrenal tonic to balance and restore the health of the adrenal glands following periods of stress. Borage (Borago officinalis) is a lovely garden plant, with small bright blue flowers and an informal growth habit, reaching a height of 60cm. It is waterwise, easily growing in poor soil in a sunny spot. Although an annual it seeds itself, coming up year after year. Borage is an ancient herb associated with courage. In medieval times it was infused in wine as a tonic to banish melancholy. Just looking at the list of Borage’s properties should convince you that it is a herb you can’t be without. 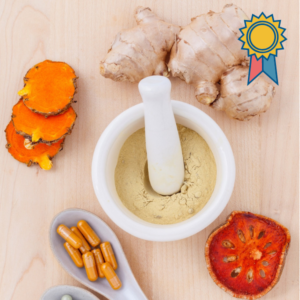 It is a cooling, cleansing and refreshing herb with adaptogenic, demulcent, diuretic, expectorant and anti-inflammatory properties. A poultice of crushed Borage leaves will relieve insect bites and stings, reduce swelling and bruising and is also helpful for clearing up boils and rashes. To make an infusion pour one cup of boiling water over a quarter of a cup of bruised fresh leaves. Steep for five minutes and strain. The infusion can also be used as a gargle for sore throats and for tired eyes. To make a poultice chop fresh borage leaves and stems in sufficient quantity to cover the area being treated. Cover with a strip of cotton gauze to hold the poultice in place. The poultice is soothing and healing to skin inflammations, though the prickly hairs may be irritating. No known side effects have been reported when borage preparations are taken internally in appropriate forms and in therapeutic dosages. 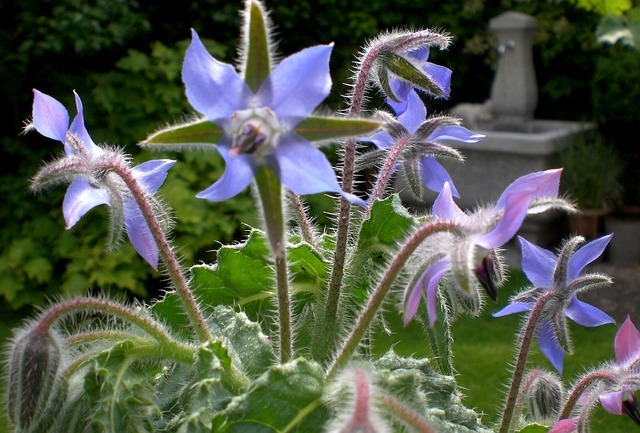 External contact with fresh borage leaves may cause skin rashes in sensitive persons. 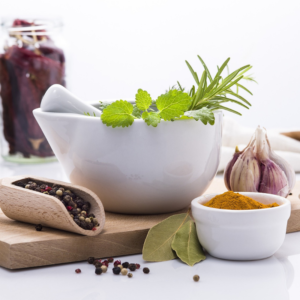 No interactions between borage and standard pharmaceutical preparations have been reported. If you have dry skin, and most of us have in winter, try this recipe. Beat together 1 egg yolk, 10 ml of almond oil and 7g. of fresh yeast, or use dried yeast mixed with a little warm water to make a paste. Add 15 ml of strong borage infusion, made by pouring 250 ml of boiling water on to 45 ml of crushed or chopped leaves. Smooth the mixture on to the skin and leave for 10 minutes. Wash it off with warm water, pat dry and apply moisturiser. Borage is traditionally grown in cottage gardens, both as a culinary herb and because bees loves the flowers, yielding an excellent honey. It is a good companion plant and mulch for most plants, being an excellent source of minerals, especially calcium and potassium. In particular , borage and strawberries help each other and strawberry farmers always set a few plants in their beds to enhance the fruits flavour and yield. Borage is also a good companion for tomatoes – both seem to improve in growth and disease resistance when planted near each other. I use the decorative flowers in salads, punches and desserts. The leaves have a light cucumber taste. Cook like spinach or add to spinach, add to bean and pea soups, use with fish or make Borage fritters by dipping the leaves in batter and frying until crisp. Add shredded leaves to salad or mix with cream cheese and gherkins for a dip or sandwich filling. We like to impress our guests with exotic sounding recipes containing borage such as La Salade de PlusieursHerbes, Gruene Sauce and Acquacotta di Verdure. In plain English these fancy names mean a “mixed herb salad”, a “green sauce” and “cooked water with greens.” But we never tell our guests that. def gonna plant some with my strawberries. Just need more space hahaha my garden is so full at this point! I will look at the nursery to see if I can find a borage plant or I will have to grow it from seed. I will check Borage at the nursery for my garden and will ask for assistance if I can’t find it. Definitely planting Borage in my garden. I am excited to say I’ve never even heard of this many uses for borage and I can’t wait to experiment with it more. I’ve never tried to grow or use it, but I’m thrilled to have stumbled across such a useful, downright necessary herb for a family apothecary and garden. For me Borage oil holds special interest as an anti-inflammatory due to the high levels of the fatty acid called gamma-linolenic acid (GLA), and it is the inflammation that needs to be prevented. I have heard Borage Oil pills are good for anti aging – is that true?